For many people Paddington will always conjure up images of one of the most popular characters ever to have occupied children's literature - Paddington Bear. And since the Victorian train station forms the focal point for many of his adventures it is little wonder that it is so alive in the popular imagination. Today there are even more reasons to visit this vibrant, energetic part of London. Pubs, clubs, restaurants and shops are everywhere. The Cleveland Arms, Dickens Tavern and Paddington Casino are but a few of the social hubs. 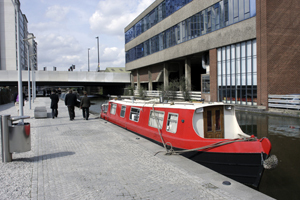 Little Venice with its quiet streets and lovely canals is just 10 minutes walk from Paddington station and home to the Canal Café Theatre, a wonderfully intimate venue for budding writers and established comedy talent. The theatre is currently the resident home of the world's longest running live comedy show, Newsrevue, now in its 25th year. So whether you need to get to the City for work or business or the West End for a spot of shopping or catch one of theatre land's box office delights, it couldn't be easier from W2. With excellent transport links to every part of the capital and beyond, Paddington is the place to be! Paddington is the London terminus for many long distance trains travelling as far a field as Birmingham, Penzance and Swansea in Wales. It is serviced by both Heathrow Express and Heathrow connect trains as well as the Hammersmith & City line. The station also has a thriving bus network.